The Rover (2014): Written and directed by David Michôd, from a story by Michôd and Joel Edgerton. 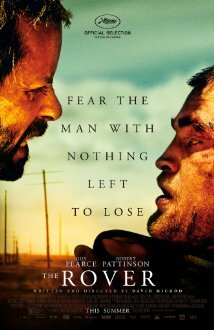 Starring: Guy Pearce, Robert Pattinson, Scott McNairy, Susan Prior, and Anthony Hayes. Rated R for language and some bloody violence. Running time: 103 minutes. By premise alone, David Michôd’s sophomore effort sounds like an oddly belated cash-in on George Miller’s Mad Max franchise, back when Mel Gibson was the exact opposite of box office poison. We wind up in the Australian Outback, for one thing, and in a post-apocalyptic future for another, where centralized government has all but collapsed. Yet tonally, we’re brought to new heights (or depths, if you prefer) of desperation and violence. More than a riff on Mad Max, The Rover becomes a soul-searching western in the vein of Clint Eastwood’s Unforgiven or Pearce’s own The Proposition. The film begins on modest terms—man parks car, thugs steal car, man pursues car by any means necessary (and I do stress that last part). Yet Guy Pearce’s Eric has much more on his mind—a haunted past, as you may guess, but one that bleeds into his present and future. Further complicating Eric’s singular purpose are the people who stand in his way, more often than not toting firearms. But when Eric finds Robert Pattinson’s Reynolds, a surviving member of the gang who stole his car, he plans to use the naïve simpleton to lead him to his rightful property. Michod has constructed a future that seems coated in sand, built not just on fear and desperation but a creeping sense of nihilism. Here, people don’t talk much, and when they do, it’s about currency. Everyone lives in the here and now, or else they live in apathy. That may sound bleak, (and it is—Michôd captures it brilliantly in desolate landscapes of rock and stone), yet there’s always a mournful humanity struggling to assert itself. In fact, for such a dark and violent saga, The Rover shows more respect for human life than we’re used to seeing in the movies. Sometimes that comes directly through dialogue, as when Eric lectures Reynolds, “You should never stop thinking about a life you’ve taken. That’s the price you pay for taking it.” But it also comes in the smaller moments—the way a character’s eyes flash upward to see a gun barrel pointed at his temple. Or how Michôd’s camera concentrates on faces—both human and animal. And how every death, both on-screen and off, feels like a punch to the gut. That humanism plagues our main character at every turn—he’s a man who’s all but lost his faith in humanity and possibly life itself. He wants so desperately to mourn for his mistakes, but sees no sign in the blasted landscape to confirm that he ought to. He may preach to “never stop thinking about a life you’ve taken,” but with every life he takes, he feels his grip on morality slipping away. That Michôd never completely betrays overt sentimentality may turn off some viewers, but he maintains the tension between grief and indifference at an expert level. What begins as a tale of a loner is complicated by Eric’s encounter with Reynolds, who is much resourceful than he first appears. We’ve seen dymanics like theirs before, but we never get the moment we expect—of the two men completely trusting and understanding each other. Michôd always leaves those feelings below the surface of their relationship. That Pearce delivers stirring work should come as no surprise—he’s struck me as more of a working-man’s actor than a movie star, but that’s partially why I love seeing him onscreen. His technique is to play a character precisely, free of Oscar-baiting moments. Watch how his face gradually softens from its grizzled intensity in key scenes of vulnerability. The revelation here is Pattinson, who I had pegged as “that awful actor from Twilight.” He could have easily overplayed his character’s mental deficiencies, but he always suggests a sense of sympathy and intelligence underneath his innocent veneer. In one scene, he relates precisely how he infiltrated a mercenary camp, as if he’s discovering a skill he never knew he had. This is what happens when you work with the right director. I love so much about this movie, yet I wonder if it feels a bit small. We don’t have much narrative thrust here, which makes certain scenes feel extraneous. And Michôd never fully resolves the logistics of the killings—characters will drop their guard for narrative convenience, meaning we have to really suspend our disbelief at certain points. And a key revelation toward the end about Eric’s past simplifies what could have been more potent left unstated. Yet I’m so glad we have films like The Rover in summers so crowded with disposable blockbusters. If only I could convince America to go see it instead of the Transformers sequel opening this weekend. Sigh.